Nestled in a magnificent canyon, embraced by crimson shale bluffs and milky gypsum hills, Roman Nose was once a favorite retreat of the Cheyenne Indians. And no wonder, The Spring of Everlasting Waters gurgles forth from subterranean rivers at the rate of 600 gallons per minute, feeding a recreational paradise of waters and wildlife. Today, Roman Nose is a retreat for you ... a secluded setting for splashing fun in our natural rock swimming pool, a challenging round on our 18-hole golf course, and fishing and boating on nearby lakes Boecher and Watonga. Trout fishing is popular November 1 through March 31. Cheyenne Chief Roman Nose, for whom the area was named, would marvel at the modern amenities now offered visitors to this picturesque playland. The newly remodeled Roman nose resort Lodge has 47 inviting guest rooms, three large meeting rooms providing 4,315 square feet of function space, 10 cottages and a large dining room filled with the alluring aroma of home-style cooking. Also on the grounds are ten cottages equipped with kitchenettes and fireplaces, along with clean, wooded campgrounds and picnic shelters. Roman Nose Resort preserves the natural scenic wonders of the canyon, while hosting guests with all the luxuries of home and conveniences of a fine hotel. Guests will also find cabins, group camps, camping and RV sites, as well as tipi rentals. There are picnic shelters, the Redbird Restaurant, General Store, ten cottages equipped with kitchenettes, Boecher and Watonga lakes, a grocery, cafe, hiking trails, an enclosed fishing dock, paddleboat and canoe rental, swimming pool and beach, miniature golf, tennis, an airstrip and a play-ground. 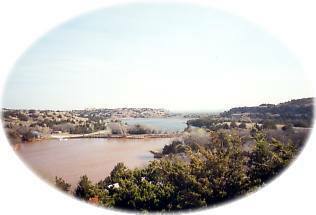 Roman Nose State Park provides the RV and tent campers seven campsites amongst the natural scenic wonders of the canyon. There are sites with 12 full hookups, 26 electric/water hookups, 10 pull-throughs, 45 primitive sites, and 1 group camp. Restrooms/showers, sanitary dump station, picnic shelter, and picnic areas at each camp area. Tee Pee Rental - What more fun could you have than to spend the night in one of the three "rent-a-teepee" rentals that sleep 2 adults and 2 children. Each tee pee sets on a cement pad with indoor/outdoor carpet, and rents for $25.00. Bring your own bedding, cots, etc., electrical outlet, cookout grill and picnic table supplied. Showers and restrooms nearby. Roman Nose Resort Park offers so many varieties of overnight accommodations from RV and tent sites and group camp buildings, to tee pees, to a modern lodge, and to add to all this there are ten cottages equipped with kitchenettes and fireplaces. Roman Nose Riding Stables, located in scenic Roman Nose State Resort Park is Oklahoma's newest and most exciting equestrian playground. Roman Nose Riding Stables offer one, two, or three-hour trail rides over some of the most picturesque canyon country the state has to offer. All trail rides are $14.00 an hour and advanced reservations are required. Roman Nose Riding Stables offer a three-hour interpretive dinner ride where guests are guided through the canyon country and across the lakes to a remote area where dinners prepared over an open fire, much the same as dinners were prepared on the trail drives of years gone by. The fee for the three-hour dinner program is a modest $40.00 per person. Roman Nose State Resort Park is also the newest equestrian playground for those who have their own horse and are looking for a new place to ride. "Pack Saddle" camp area is the designated equestrian campground complete with pens and stock tank for your mounts. Countless loads of topsoil and yards of terracing have made this course newly lush in recent years. But with narrow sloping fairways and elevated greens, accuracy remains the key to success here: golf pros insist a high, soft flop shot is the secret to good scoring. Canyons border fairways and greens, and drop-offs of 30 or 40 feet are common. The course's signature fourth hole is known as the "Canyon Hole." This 444 yard par 4 hole can also be afforded the added distinction of being the Toughest hole due to its natural hazard.